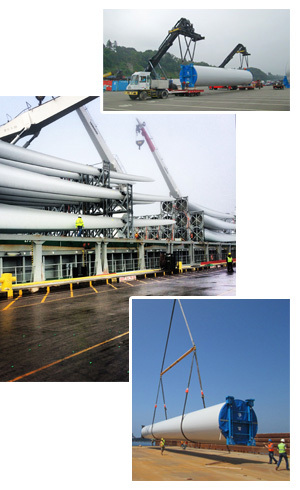 Jones Stevedoring Company is the leading stevedore of Wind Energy Cargo in the Pacific Northwest. Pieces of wind energy cargo are often oversize, delicate and part of a set. This is why it’s critical that this cargo be handled with great care at every touch. Our special handling methods, customized equipment, and efficient and safe handling of this cargo time and time again make Jones Stevedoring Company the stevedore of choice for shipping lines, manufacturers, suppliers, and their customers.